Keep it Healthy: Find out how and why to use Aeration for your grass and garden. Air pores in the soil help water move through the soil. Oxygen in the air is also needed for root respiration. If you have heavy or compacted soil it is helpful to aerate your soil and let the lawn breathe. This will help your grass grow and prevents waterlogging and moss build up. Avoid doing this in very dry or very wet conditions. Move the fork back and forward a little then pull out. This cracks the soil a little and creates a hole in the soil to allow air in. Doing this during the spring and autumn season has a good effect on the lawn. These are a series of blades on a roller and can be push types or automated. These impact a greater area and are often quicker to use but may not be consistent in depth across the lawn. 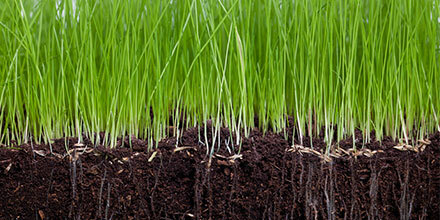 These take a core of soil out of the ground which is usually only when the soil needs better aeration and drainage. The holes can be filled (topdressed) with sand to help water pass through the soil. The cores are removed, then broken up and raked into the surface, the grass tufts can be lifted by the mower on the next cut.